Come down to the Thames foreshore, and meet the fish which live here. Learn more about the fish in the Thames, and how to identify different species. 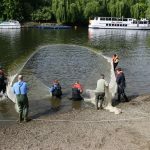 Watch fishery officers as they carry out a fish survey to help understand the fish populations on the Thames. They will use a seine net (see photo) to capture a sample of fish, and then recorded them to provide a record of fish numbers, species and size. We will also do a foreshore walk and record the number of elvers we find – baby eels! This section of the Thames, positioned upstream of Lambeth, is known as the Upper Tidal Thames and is categorised as the freshwater zone – a leafy and open reach with islands and backwaters containing freshwater species such as freshwater shrimps and snails, which provide a valuable food source for fish such as dace and roach, and summer visitors such as flounder, smelt, elvers and goby.